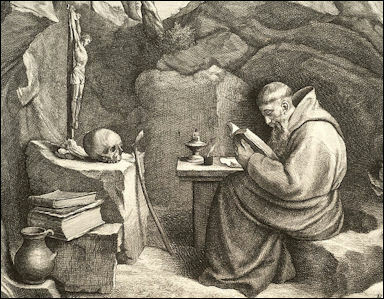 Painting by Francis Wenceslas Holler of St. Francis of Assisi in his cave retreat. Solstice is coming up, a time of spiritual retreat across many traditions. As I head out on my own retreat, I thought it was a great time to share some thoughts on how to prepare and engage in a spiritual retreat of your own. A retreat can be anywhere from a day to months in length (in some traditions years), and can be done in your own home or away. Of course there are organized spiritual retreats at centers around the world, or you can combine retreat with pilgrimage, drawing upon the energies of a natural or religious destination as part of your journey. Even if you stay home, a retreat is always a journey – a journey outside of your usual daily routine and mind. The purpose of retreat is to clear the decks of your mind, allowing yourself to discover a layer of your being that is difficult to access within the busyness of your daily life and routine. Sometimes you might also be seeking healing or clarity on a particular life issue, or striving to break through a spiritual plateau or dark night. Whatever your intentions, it’s important to trust your own intuition about what you need, and to take your retreat time seriously. This doesn’t mean you won’t enjoy your retreat time – hopefully you will – but sometimes growth is difficult and when we are alone with ourselves, all of our shadows emerge. So it’s important to walk the line between moving outside your comfort zone and feeling supported and safe. Prepare to disconnect. Make schedules and plans and contact lists for whomever will be handling your usual responsibilities – coworkers, babysitters, spouses, house sitters. Think of everything that could possibly come up, everything they could possibly want to contact you about, and write it down. Walk through all of it with them. This isn’t just for them, it’s for you – going through this process will help you to let go once you are gone. You will know you have done all you can to assure things will run smoothly while you are away, so then you can simply surrender to fate. Whatever happens that you didn’t predict will be taken care of – without you, by someone else – and that’s ok. Even if you are simply doing a day retreat, preparing in this way can be very helpful. Letting go of control is really one of the most important aspects of retreat. You need to create space in your mind and being, space for new understanding to arise. If you are away and your mind is cluttered with everything that might be going on at home, you won’t have that space. Nature can be such an important part of spiritual retreat – let yourself settle into your natural rhythms. If you are in contact, make it intentional. If you are going to be in contact with the ‘outside world’ during your retreat, make it substantive. If all of the logistics are covered beforehand, when you do make contact with work or family, you can make it purposeful and/or heartfelt, focused on connecting briefly rather than re-engaging over details that will only pull you back into your regular life. However, really question how much contact you need, how much of the urge to connect might be a fear of letting go, or even a way of holding yourself back from shifts that deep down you know you would like to make. Often we are of two minds when it comes to retreat – we engage in it because we want to change, but then when confronted with change, old fears arise. The comfort of the known begins to take precedence, and staying in contact with ‘home’ maintains our link with that known. If you need to make contact, it’s also best to try to establish when that contact will be before you leave, so you (and those you are communicating with) are not spending time worrying about when or how you might connect. Do the same with media, email etc. Be very intentional about what your mind comes into contact with during your retreat. Turn your phone and all other devices off for your retreat (except for the few times you’ve prescheduled to make contact, if you are indeed making contact.) Truly be alone with yourself. Even refraining from music or reading can be useful, although if you are intentional about what you listen to or read, this might also enhance your retreat, so you can follow your intuition on this. Establish a schedule for your retreat. If you are attending an organized retreat, of course this part is taken care of for you. But if you are conducting your own retreat, it’s usually best to plan beforehand what your days may look like. If you are engaging in spiritual practice, when and for how long? What other activities will you engage in (hiking, journaling, etc?) Because of the fear factor, without a plan it’s easy for a retreat to slip into vacation mode. Your structure and rituals are your container for your retreat – they provide the framework within which you can let go. Set your retreat intentions. Of course all this outer planning is really just preparation for your inner work. Why are you going on retreat in the first place? Be honest with yourself about this. What is your driving force? What are you hoping for? Contemplating this before you go will help you cut through any projections or expectations you may have, freeing you up to just let things unfold once you are there. Ritualize your entry into retreat. When you leave home – or if you are retreating at home, once you start your retreat schedule for the day – do so in an intentional way. Perhaps say a blessing for your home, and ask for guidance on your retreat. Express your gratitude for being able to retreat, including thanking those inwardly who are making it possible (see first bullet point!) Mark the official entry into your retreat time with intention. 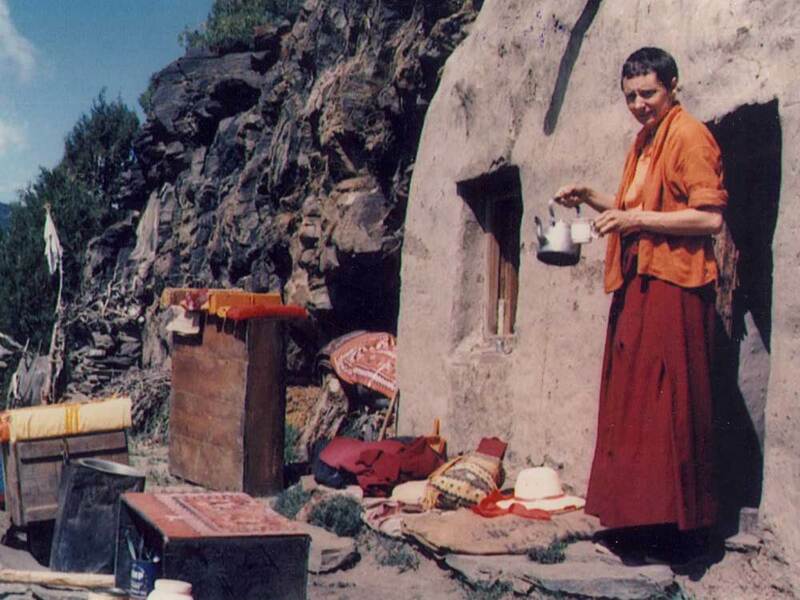 Jetsun Tenzin Palmo engaged in a 12 year retreat in this cave cottage. Her experiences are shared in the book Cave in the Snow. Be honest. Once on retreat, be honest with yourself. Where is your mind really? Are you narrating your retreat to others as it occurs? Daydreaming about how great you will feel at the end? Worrying about what’s going on at home? Years ago when boom boxes (for those too young to remember, these were giant portable radios) were all the rage, I remember going to a beach filled with competing boxes, playing music so loudly it wasn’t possible to even hear the surf a few feet away. Thinking of home or mentally talking to others while on retreat is like bringing a boom box to the beach. Leave it! There are a lot of different kinds of retreats, so it’s hard to give specific advice on how to handle inner challenges that may arise. This is more personal, and somewhat guided by the spiritual tradition and/or teacher or guide that you relate to. But there usually are challenges – we rarely shift to a new understanding without first encountering a block. So when they do come up, know it’s ok. Just be honest about what’s arising. If it’s too much for you to handle, of course reach out to your own spiritual support guide or network. But also entertain the possibility that you can just let it be, just watch what’s going on within you and it may move through on its own. Let go. Ritualize your exit too. Don’t judge a retreat. Just like meditation, sometimes you can’t really tell how it’s impacted you immediately after the fact. Big experiences and insights aren’t always the point. So simply express your gratitude, and prepare for your re-entry into your regular life. Set some intentions for what you’d like to take back into your life with you from retreat, and expect some bumps. You may need time to process, to integrate, and that’s all ok.
Have a great retreat Lisa, this was a great reminder about its value. Have a wonderful retreat Mu. I hope you are able to get some time for yourself too these days Antoinette! Felt pulled to repost this post on retreat. You can retreat for half a day, a weekend, a week or more. Taking this kind of break can be such a great gift to give yourself. Wishing you this time and space to unfold. Thank you Susan for your thoughtful comment.